앞서 공개된, 2019년 5월 25~26일 이틀간 일본 도쿄(동경/東京, Tokyo)에서 열리는 첫 리브레오피스 아시아 컨퍼런스(LibreOffice Asia Conference)의 발표제안요청(Call for Proposal)이 공개되었습니다. 리브레오피스 아시아 위원회(LibreOffice Asia Committee)는 2019년 5월 25일(토), 26일(일) 이틀간 일본 도쿄(동경, 東京, Tokyo)의 사이보즈(Cybozu, Inc.) 도쿄 사무실에서 열리는 리브레오피스 아시아 컨퍼런스 2019 도쿄(LibreOffice Asia Conference 2019, Tokyo)의 발표 제안요청을 합니다. 리브레오피스 아시아 컨퍼런스(LibreOffice Asia Conference)는 아시아 지역의 리브레오피스를 사용하는 사람과 기여자(예를 들어, 개발, 번역, PR/마케팅, 품질 보증[quality assurance] 등의 여러분야)가 모여 경험과 지식을 공유하는 행사입니다. 이 컨퍼런스에서는, 아시아 지역에서 리브레오피스의 지원, 훈련, 리브레오피스(LibreOffice)로 마이그레이션, 실제 표준 형식 ODF, 개발, 아시아 지역의 커뮤니티 활동 등등의, 리브레오피스 사업에 대하여 논의할 예정입니다. 그리고, 리브레오피스(LibreOffice)을 운영하는, 비영리단체인, 문서재단(TDF, The Document Foundation)의 여러 이사진을 포함한, 여러 해외 손님들을 초대할 예정입니다. 이번 행사에는, 일본 커뮤니티 자체 행사인, ‘리브레오피스 카이기’(LibreOffice Kaigi, ‘Kaigi’는 일본어로 ‘회의[會議]’라는 뜻)와 같이 열립니다. 그래서 영어 트랙과 일본어 트랙으로 구성될 예정입니다. 리브레오피스(LibreOffice), ODF(The Open Document Format)에 관한 다양한 주제에 대하여 환영합니다. 예를 들어, 다음과 같은 주제입니다. 리브레오피스(LibreOffice) 이용 사례 소개, 리브레오피스(LibreOffice) 코드 개발에 대한 기술적 심층 논평, 리브레오피스(LibreOffice)의 사용에 대한 사소한 팁 등등입니다. 모든 발표는 질의응답(Q&A)을 포함하여 25분이 될 것입니다. 주저하지 말고 발표 제안 신청을 하세요. 발표 제안 수락여부는 3월 22일 (금) 에 알려드리겠습니다. This call is for the conference day on May 25th (Sat). This event will include annual LibreOffice Kaigi, which is a local event for Japanese speakers, thus it will have at least two tracks; English track and Japanese track. 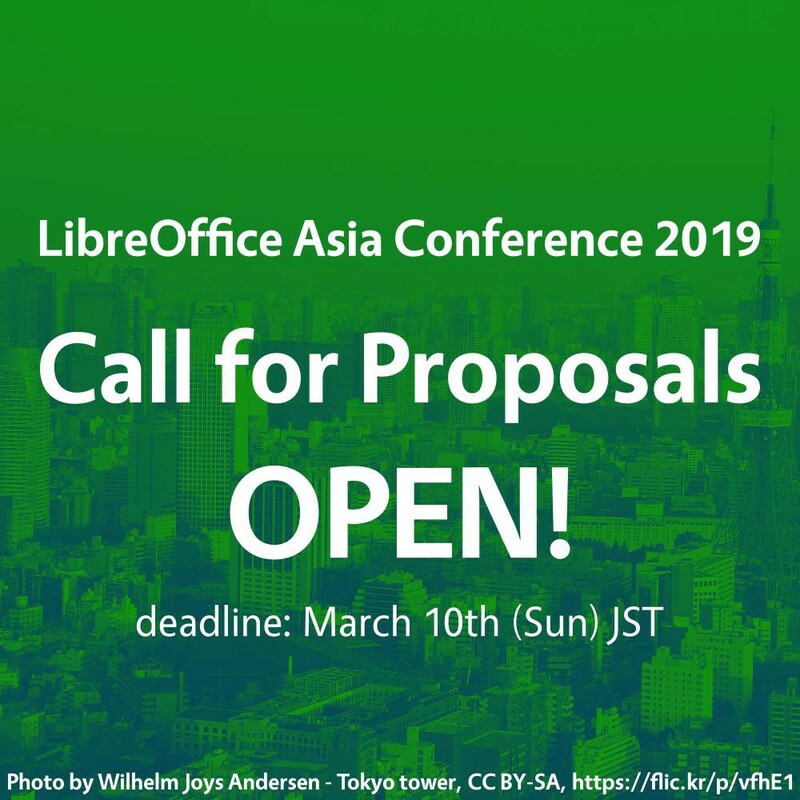 Any topics related to LibreOffice are welcome; introductions of LibreOffice use-cases, technical deeper commentary of LibreOffice code development, or small tips of LibreOffice usage and so on. The talk will be 30 min includes Q&A. Even if you live far from Tokyo, please don’t hesitate to apply your proposals. The deadline will be March 10th (Sun) JST. We will inform you if your talk was accepted or not by March 22nd (Fri) JST.